Nordtrib 2016 came to a close last Friday and I returned home inspired and energized for the next stint in my PhD research. This post is an overview of the conference and summarises the outlook on the field for the years to come based on the round table discussions and key notes. For details on the presented research follow the links to the conference website and the respective authors. Nordtrib is a bi-yearly conference organized by our Scandinavian colleagues. Every 2 years one of the tribology research groups in Denmark, Norway, Sweden or Finland hosts the event. This years organizer was Finland and they chose the quiet and peaceful town of Hämeenlina as the location. With over 200 participants, 99 full paper submissions and about 160 talks this edition was the largest since its inception in 1984. The conference covers the full breadth of the field of tribology. Our group presented two full papers [1,2]. The conference opened on a sad note with the commemoration of the recent passing of Peter Jost the author of the famous Jost report (1966) that launched the field of tribology. Fifty years have past since the Jost report and the conference therefore featured a round table discussion on the future of tribology on the final day. Professor Margaret Stack had the honour of kicking off the conference with a plenary talk on tribo-corrosion. The talk discussed that the growth of offshore renewable energy makes the field of tribo-corrosion more relevant than ever. New challenges are given by large scale offshore wind parks, tidal turbines and ocean wave energy. Of particular interest is the interaction of (solid) particles like hail with the offshore structure and the resulting accelerated wear due to the corrosive environment. The development of mapping techniques was discussed to understand the mechanism behind the erosion-corrosion. A glimpse of the future of computational tribology was shown by dr. Anssi Laukkanen. He discussed the current state-of-art in integrated computational materials engineering (ICME). ICME is an integrated multi scale approach which aims to merge characterization, experiments, modelling and simulation in one work flow. The outcome is a computation driven design methodology for material micro structures. In his talk dr. Laukkanen explained this work flow and highlighted a few impressive examples of this paradigm. Super hard carbon coatings and their surface chemistry was the focus of the talk by dr. Maria Isabel De Barros Bouchet. She gave an in depth talk on the almost super lubrication approaching tribological properties of biodegradable organic additives (like oleic acids) on Nano Crystalline Diamond (NCD) and Diamond Like Carbon (DLC) coatings. For this a combination of analytical and computational tools were used to explain the atomistic origin of the low friction mechanism . The technology that she and her group developed was successfully applied in gasoline engine parts. In the final plenary talk of the conference professor Patrick de Baets showed us the challenges related to the use and testing of polymer based tribocomponents. Further an in-line measurement system mounted on a two disc machine was showcased. The system used a high speed camera and image matching and stitching to monitor the evolution of the tribofilms in-situ. Finally, modern trends in reinforcements (e.g. natural fibres) and lubricant additives (e.g. nanoparticles) were discussed. Tribology should focus (again) on mechanisms and fundamental understanding. The current approach of trial and error of for instance comparing a bunch of materials and selecting the best one based on COF or wear rate is counter productive. Nothing is learned from it and each time the tribosystem changes the process starts anew. This was partly attributed to the fact that most tribology research is industry driven and funded. Tribochemistry at the molecular level should be given more attention to better understand interaction with and modification of the surface and its relation to tribofilm formation. 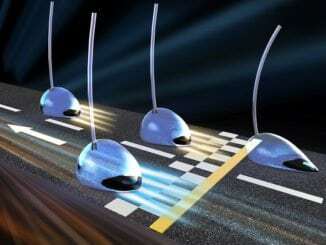 For instance the chemistry can be designed based on the nature of the running surface. Until now wear has been investigated at the micron level because it is easy to measure. However, in a wear cycle typically only mono layers are being removed. Therefore here also a shift to the mechanisms at a smaller scale is needed. Surface engineering by means of the various texturing technologies as presented on the conference. Computational tools like ICME and molecular dynamics are seen as the means to reach the above goals. The above recommendations for the future were already reflected in the submitted talks. I have seen many works on DLC coatings and the mechanisms behind the formation of tribolayers and triboinduced modifications to the DLC surface and the relation to its lubricity. Surface texturing and its relation to friction and wear was also a hot topic, particularly using laser interference patterning techniques. What further interested me was the work by professor Gwidon Stachowiak on the measurement and characterization of 3D surface texture. He tried to answer the age old question: How to relate surface texture to functional properties of the surface? With particular interest for the upcoming texturing techniques. One of the proposed solutions was based on fractal dimensions which can extract anisotropy, roughness and flatness . Looking back I found it a very interesting conference and it was a great way to get a condensed overview of the field. It gave me inspiration on how to further improve my research. Next to that I had the pleasure to meet a bunch of very nice people. So, I hope to see you all in two years at Nordtrib 2018 in Uppsala! To conclude this post a question to the reader: What is your opinion on the future direction(s) of the field of tribology? Let us know in the comments below! Bouchet, M. I. D. B., Matta, C., Le-Mogne, T., Martin, J. M., Zhang, Q., Goddard, W., Kano, M., Mabuchi, Y., and Ye, J., 2007, “Superlubricity mechanism of diamond-like carbon with glycerol. Coupling of experimental and simulation studies,” Journal of Physics: Conference Series, 89, p. 012003. Podsiadlo, P., Wolski, M., and Stachowiak, G. W., 2015, “Fractal Analysis of Surface Topography by the Directional Blanket Covering Method,” Tribology Letters, 59(3), pp. 1–11. PhD researcher at the University of Twente, Enschede, The Netherlands. Working on simulating running in of deterministic rough-rough boundary lubricated contacts under influence of coatings and particles. Nice to know you had a great time on a conference! Its interesting, Nordtrib was the largest and also STLE reported to be the largest ever this year. Could be a trend! Regarding the future of tribology, I agree with most of the points you highlighted. I totally agree with the point that we have to perform the analysis at the atomic scale to develop the deep understanding of the processes, as for example, in tribofilms generation and superlubricity studies. Regarding the modeling, in my opinion, in near future, continuum based models will still be relevant and the multi-scale approach must be taken. The molecular dynamic approach and even finite element are quite time consuming in many cases. I believe, they can be applied to study fundamental processes, especially the molecular dynamics. I also like the last comment. As a mathematician, I believe in modeling tools and I hope they will be developed further and help us in tribology. “The Conference cover[ed] the full breadth of the field of tribology.” If accurate, we are in big trouble! By the account given, Nordtrib 2016 was yet another EHL festival, evidencing our industry’s incapability to escape a dead paradigm. Attendees were urged to study “modification of [surfaces] with regard to tribofilm formation,” investigate wear mechanisms (with regard to as-formed tribolayers), and consider “surface engineering” (again) with regard to “texturizing technologies” to again coat imperfect surfaces. Add to this, the additional plea to use ICME to advance these (ancient) methods. Congratulations… We have just proved that absolutely nothing has changed in the last 60 years since the birth of our friction-fighting discipline. We are now asked for our opinion of the “future direction of tribology” based on the foregoing. Mine is… go in the opposite direction! The future of tribology lies in surface perfection. We now have the means to achieve near atomically-perfect smooth friction surfaces. This is the tribological science that needs investigation and further development. I would like to see the tribo-corrosion ICME models when the metallic surfaces are free of asperities! Many in tribology are aware of the true nature of DLC coatings and their horrible surface morphology. DLC is not self-levelling. DLC merely follows the contours of the underlying substrate, creating super-hard asperities. Oleic acids are not going to change that. I see this situation as a horrible eulogy to the spirit of the original Jost Report. We have new frontiers in tribology to explore, yet we cannot pry our fingers from the grip onto old, ineffective, techniques. As I type this, there are some of our tribology brethren advocating the continued use of CPs or organophosphates in lubricants. When will tribology evolve? Consider this: 200 participants; 160 talks; 99 full paper submissions. Zero discussion of ISN surface perfection and its promise of revolutionizing tribological science and mechanical engineering. If we are truly going to advocate a “world without friction” as our goal as tribologists, we have to be brave enough to envision such a possibility ourselves! That means finally letting go of our death-grip on EHL and daring to consider new approaches to friction elimination. H. Peter Jost gave us the word tribology – “the interdisciplinary science and technology of interacting surfaces in relative motion.” At the very heart of that definition is the study of the “interacting surfaces” themselves. Let’s get tribology to focus on the perfection of that surface interaction, rather than how to slap a complicated bandaid on its continued imperfection. I like the idea of nano-polishing, though I am not sure, if it is possible to use it in all applications. As for example, in applications, where its not the friction, but wear is of concern. Also, from our modeling results of particle-by-particle wear, the resultant surface roughness depends on the applied conditions and you may get smoothening or you may get roughening. I guess, it is the same with the polishing. So before a widely applicable and controllable ISN technology possible, a better understanding of these discussed processes is needed, I think. It would be great to be able to do ISN everywhere, where its needed of course. In defense of the conference being an “EHL fest” I have seen many BL regime works and the needed rigor that goes with it on identifying the mechanisms at the interface. In order to go the “other direction” we need the in depth understanding of the in-situ polishing mechanism and the surface modification it does. In that sense I fully agree with the round table discussion and with you Rick. We need to be careful becoming a phenomenological science instead of a science based on fundamental understanding. In a quick search I could only find one publication explicitly on ISN . For this to become the new paradigm it needs far more attention. Attention which could be raised by presenting your work on a conference like Nordtrib ;-). Which was another part of the discussion that I did not mention. We need to promote our work better. I do agree with Aydar, it is not the one stop solution to every tribological problem. Mosleh, M., and Shirvani, K. A., 2013, “In-situ nanopolishing by nanolubricants for enhanced elastohydrodynamic lubrication,” Wear, 301(1-2), pp. 137–143. Aydar, wear is a byproduct of frictional contact. Remove the asperities and I challenge you to show me “wear” in an (interacting like metals) system. Dennis, I doubt that the additional “in-depth understanding” of ISN you say is necessary will be had in the existing tribological climate. That is my point regarding turning in the “other direction” with our efforts. Further, if SEM images of the SGAN particles on the surface of the metal and detailed images of the resulting ploughing deformation wear channels through the surface asperities is not sufficient “understanding of the in-situ polishing mechanism,” exactly what would yield the necessary understanding? If additional “rigor” is required in elucidating the ISN mechanism, I suggest our tribology brethren get cracking on it right away. Both you and Aydar state that ISN is NOT the “one stop shop” for friction elimination. If it isn’t, I would sure like to see what you both feel meets that criteria! Rick, friction in metal-to-metal contacts consist of at least two parts; ploughing/abrasion and adhesion. Same for wear. Perfectly smooth surfaces typically exhibit larger adhesive contribution than non-smooth ones. You’re describing wear as if it is only abrasive…but in a plain bearing with a bronze bushing e.g., there’s quite some adhesive wear ending up as material transfer from the bushing to the shaft. There are numerous contributions showing that rougher surfaces improve tribological performance in terms of friction and wear. I agree with you that “The future of tribology lies in surface perfection.” But, as I see it, perfection is not about making the surfaces perfectly smooth. Andreas, you would do (the late) David Tabor proud! No worries, I too an am adhesion theorist, despite having been surrounded by delamination people in Massachusetts. With regard to Phantaslube®, I neglected to discuss here (but did discuss in detail in the earlier Tribonet article) the fate of those as-formed SGAN spheres. 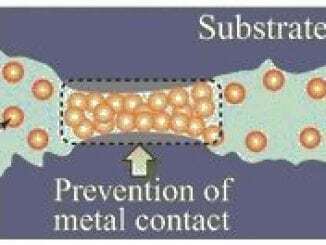 Those endohedral metallofullerenes exhibit superparasitism and permanently stick to the surface of the metal, acting as nanoscale “ball bearings” that prevent any adhesion element to the equation. Mentioned here now in explanation, I trust you and Dr. Tabor will forgive the oversight. Andreas, you suggest that numerous studies show that surface roughness and texturing can “improve” tribological performance. I, however, suggest that this is a very (tribologically) dangerous thought and concept. I’ll explain . . .
Purposeful surface roughness, or the idea that use of asperities to decrease the actual contact area (as compared to the nominal area) for purposes of adhesion reduction is using one problem to battle another problem. Asperities are “imperfections” on the surface, points of integrability vulnerability, and the source of damaging friction in mechanical systems. This inconvenient truth teaches that any lubrication paradigm that incorporates them as a “solution” to friction is fatally flawed. The necessary paradigm shift for modern tribology is to recognize that mere increased machine life is not satisfactory! Tribological “Band-Aids” are not the solutions to base entire scientific disciplines on. The “real” solution, and suggested goal, is UNLIMITED machine life, do to the elimination of the root cause of mechanical failure – asperities! Do the math. If the load is actually carried by less than 1% of the intended/designed (nominal) surface area of the mechanically contacting surfaces, that machine is doomed to eventual failure. I won’t even go into the problems of true laminar flow of lubricants in the presence of asperities. All, please forgive the autocorrect spelling mistakes above, courtesy of my “smartphone”. p.s. I appreciate the fact that you were only able to find one paper on ISN (Mosleh and Shirvani). I promise Dr. Khosro Shirvani and I are going to remedy that situation in short order. We recently submitted an abstract to Wear for the 2017 Wear of Materials Conference in Long Beach, California. Sure, if there are no asperities, then the wear is minimized (except for fatigue wear, which would still occur). To make no asperities, it is then necessary to make the surface very smooth in advance. If you do it in situ, then the wear would be triggered, which may be important, right? Regarding a better understanding, I would say it is not clear for me, how can you achieve ISN by simple ploughing in various conditions (like load and hardness of the materials)? At high loads (low hardness), the same nano-poliching agent would create much larger wear, than at lower loads(high hardness). How to control it in situ? And what happens with the wear particles, if the oil is recirculated? Maybe a better idea would be to cover the whole surface by growing a uniform, smooth tribofilm then? Aydar, with the complete (99% reported) elimination of asperities, “wear” is not minimized, it’s abated/eliminated! Fatigue wear is a subsurface wear secondary to heat damage to the lattice/matrix from friction. Remove the friction (and its associated damaging heat production) and you take care of that problem too! The real beauty of ISN technology is that you don’t need to ex-situ perfect the surface in advance of operation of the system. The “wear” produced by ISN is beneficial and not destructive. “Wear” via ploughing deformation wear channels is the perfect asperity-removal method, as such actually serves to surface harden the underlying steel under load. The amount of “wear” (polishing effect) is determined naturally by the diameters of the SGANs, “controlled” by the size of the removed asperity (3rd body particle) that created them. So, there is no need to “control” the “wear” with ISN… nature does it for you. With respect to a “tribofilm”… Phantaslube® does produce one… the best such tribofilm known to mankind – graphene! Alright, I have now the following understanding of the wear during polishing. The surfaces are loaded and asperities come into contact and sliding starts. Each of the asperities carry part of the load. The size of the formed wear particle depends on the applied load (local). If the load is high (or hardness is low, even with the hardening), very thick particles are formed – they do not let the surface to become smoother. Thats why, in many circumstances, there is no polishing, but roughening. Therefore, removal of the asperity does not guarantee polishing. So then the SGANS are large and create larger wear and the surface cannot get polished? I do not get it, how come these has to naturally lead to polishing? During asperity interactions under load, the asperities heat up and weld together. The heat generated (on the nanoscale) is enormous; hot enough to produce a plasma event. The resulting molten wear particle gets encapsulated in graphene as it tries to reoxidize. The trapped oxygens interact with the carbons on the graphitic shell (an endohedral metallofullerene) and impart the physical properties of GO (graphene oxide) to the exterior of the sphere (SGAN – Surface Graphitized Abrasive Nanoparticle). As a reminder, GO is very abrasive. These rigid, abrasive, SPHERES cut through the surface asperities like a knife through butter. Since these cuts take the form of ploughing wear channels, the underlying metal is physically hardened in the process. If the asperities are large, the SGANs produced are large. If the asperities are small, the resulting SGANs are small. The end result (over time) is complete surface perfection of the interacting frictional contact surfaces to low single-digit nanometer roughness averages, approaching zero. This is relatively simple. Abrasive polishing balls cut the asperities until the surfaces are completely smooth. Once smooth, the surfaces are relatively immune from further scarring or damage. Phantaslube® . . . Ra = 3.4 nm. The end. This procedure does not look simple, actually 🙂 It is difficult to see, how this is self controlled at various conditions? The heating – is not always possible, must be high speed or friction/load, what happens if there is no enough heat to melt? The spheres, SGANS, cut through asperities, but why they cannot cut a bit deeper than the height of the asperities? If the load is high, they must be cutting also a bit more, thus never letting the surface to get smoother at a certain point? I understand, that once everything is smooth and hardened, then it is possible to use low viscous lubricant to separate the surfaces and generate low friction. However, even in this case, friction can be quite high, especially, if the high speed is required? Thanks for the comprehensive summary Dennis! I’ll pay this forward as as a good example of how to summarise a conference for the phd students here at Luleå UT. Hello Andreas, thanks for the compliment! With regard to the size of the SGANs being “controlled” by nature, the diameter of the spheres is controlled by the size of the asperity (and resulting third-body wear particle) that created it. These are endohedral fullerenes, so the wear particles are trapped inside. The necessary heat generated to produce the SGANs is made from the moment you start and engine. This seems impossible at first glance, but it is. 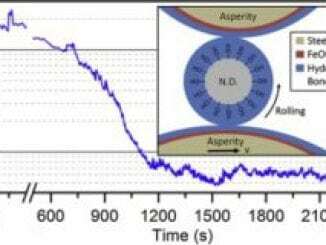 You must remember that the “plasma event” from the asperity interactions is on the nanoscale! As such, the necessary heat is almost always in the system. Yes, SGANs “cut” through metal asperities, but they don’t cut into smooth metal! If you don’t have asperities on the surface, you don’t have anything to “grab onto” for the abrasive wear to happen. The polishing agent is SPHERICAL, so the force moment is relieved by the slightest of motion on an atomically-smooth surface. This is like trying to shave a glass surface with a knife. Also, you are correct, that once you achieve an atomically-smooth surface, you may reduce the viscosity of the lubricant! Remember that in EHL, the lubricant itself can (and does) become a source of friction! Increased viscosity might be nice to overcome the average asperity heights, but its reduced fluidity means adding friction to the system. I suggest the idea is really quite simple. What I think is hard is letting go of the old ideas (and their limitations) that we have all been taught from the beginning. I think it might be good for everyone to (re-)read Rick’s article on ISN here on Tribonet. With the discussion above in mind it cleared up a few things for me. Rick, it might be that we are still clinging to the old paradigm. Still, seeing is believing, so I am really looking forward to your forthcoming article which is to be presented at the Wear of Materials conference. Something that is still bothering me is the feeling that is given of seemingly endless applicability of the mechanisms in ISN. I am imagining that certain operational conditions should be present for this to work. Something like a contact stress, velocity and sliding length diagram with a boundary running through which marks the ISN regime (this is easier to show on a whiteboard ;-)). Furthermore I think a certain initial surface texture is assumed. Would this for instance work on a turned or milled surface? Have you investigated this? Is there a limit? If so can you share where you would put the limit? “Something that is still bothering me is the feeling that is given of seemingly endless applicability of the mechanisms in ISN.” Why? Dennis, this is what a paradigm shift consists of! When you have an entirely new approach to tribology itself, that new approach necessarily has widespread application, else it’s not a new paradigm. You would like “something like a contact stress, velocity and sliding length diagram with a boundary running through which marks the ISN regime” . . . careful, we might be talking about a “Shankman Curve” pretty soon ☺. In terms of an initial surface, I’m sure there is a limit. We use Phantaslube® in transmissions. Transmission clutch packs have gross (waffle pattern) surfaces that SGANs don’t destroy. So, yes, there is a limit somewhere . . . where it is, I don’t know right now. I would assume that “macro” textures/roughness (in the millimeter range) are too much for SGANs to deal with. That’s a good thing, because transmissions wouldn’t function anymore if SGANs polished the clutch packs smooth. I bumped into recent patents of Rick Shankman and appreciate his ideas and achievements. Yet, I would say two things: Mother Nature almost eliminates friction in joints of our bones – for example in knees CoF is 0.002 and may be lower. No fullerenes, buckyballs and nanosize abrasive particles. Should we learn from a good design? Why not to make experiments with so smooth surfaces and decide about the role of asperities in friction and wear? BTW, superlubricity is normally related to smooth surfaces in an atomic scale. Another point is adhesion between surfaces in the apparent contact. I agree that tribologists are not interested to kill friction in machines and tools as they may lose well paid jobs. Right? Yet I am not sure about fullerenes. Why not just graphite and DLC? Fullerenes assume perfection. I doubt that perfection can appear spontaneously. About the Phantaslube. To my opinion PowerUp lubricants explore the same ideas to remove asperities and to reduce adhesion between surfaces in an apparent contact, right? For example, they use Isopropylphenyl phosphate as a component of the lubricant. It can be a source of carbon as well as EP agent, cannot it? Prices for PowerUp additives are competitive. Why to buy Phantaslube if the PowerUp gives up to 18 % in fuel economy if viscosity of the lubricant is lower or 8.5% if it is the same oil as in a reference test. Anyway, lowering viscosity and boundary friction is the way to go.